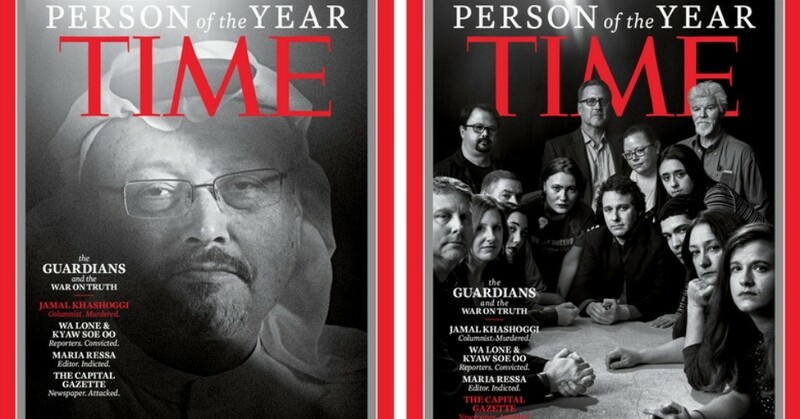 Capping off a year marked by accusations of “fake news,” hurled at journalists by President Donald Trump and other global threats to press freedom, TIME magazine selected as Person of the Year journalists who have spent the past year fighting increased hostility toward their work—including those who lost their lives as a result of their reporting. Calling journalists under attack “guardians” of the truth, the magazine announced the selected Tuesday as it prepared to release four covers of the yearly issue. One cover will feature Jamal Khashoggi, the Washington Post columnist murdered by the Saudi ruling monarchy in response to his critical coverage. The wives of two Reuters journalists, Wa Lone and Kyaw Soe Oo, who are behind bars in Myanmar for reporting on the killings of the Rohingya will appear on another. One cover shows the staff of the Capital Gazette, the Maryland newspaper where five employees were killed in a shooting in June, perpetrated by a reader who objected to content they’d published. Surviving members of the staff reported on the attack against the paper, setting up makeshift work stations outside while police investigated, and putting out a paper with coverage of the shooting the next day. And Filipino journalist Maria Ressa will appear on the fourth cover. Ressa faces up to 10 years in prison on tax fraud charges; supporters say she is the victim of a crackdown on the press in the Philippines under President Rodrigo Duterte. The world has become an increasingly dangerous place for journalists, wrote Karl Vick in TIME‘s feature article on the journalists, as the Committee to Protect Journalists (CPJ) expects to record even more imprisonments of reporters than it did in 2017, when 262 journalists were put behind bars for their work. Time also highlighted other challenges faced by journalists around the world in 2018, including increased consolidation of the media, with right-wing corporation Sinclair Broadcast Group controlling nearly 200 TV stations around the U.S.; the spread of misinformation on social media; and the loss of nearly 2,000 local American newsrooms as companies like Facebook and Google take away ad revenue. The magazine also considered the students who organized the March for Our Lives to demand strict gun control in the U.S., Special Counsel Robert Mueller, and families separated at the U.S.-Mexico border by the Trump administration, as 2018’s Person of the Year, before settling on the journalists. This entry was posted in Civil Rights, Corruption, Government, Human Rights, Human Spirit, International Agreements, Media Issues, National Security vs Police State, Peaceful resistance, Social Justice, Solidarity and tagged Capital Gazette, Civil Rights, Corruption, Human rights, International Agreements, Jamal Khashoggi, Journalism, Kyaw Soe Do, March for Our Lives, Maria Ressa, Media Issues, Press Freedom, Press safety, Robert Mueller, Rodrigo Duterte, Security, social justice, Solidarity, TIMEmagazine, Wa Lone, Washington Post on December 12, 2018 by MNgranny.